While I am still getting back into the swing of things after my fathers death, I have another guest post lined up for you. Please give Mary of Chattavore a huge welcome. Mary and I met a little over a year ago at The Southern Food Blogger Retreat in Alabama and we have been friends ever since. If you haven't had a chance to check out her blog, make sure you head on over and show her some love. Now lets get to the good stuff....Mary, take it away! Hi, I'm Mary and I write the blog Chattavore. Chattavore is all about Southern food (mostly) from scratch as well as restaurants in the Chattanooga, Tennessee area. If y'all ever come to visit (which you should, because Chattanooga is an amazing city), I'm your restaurant source! 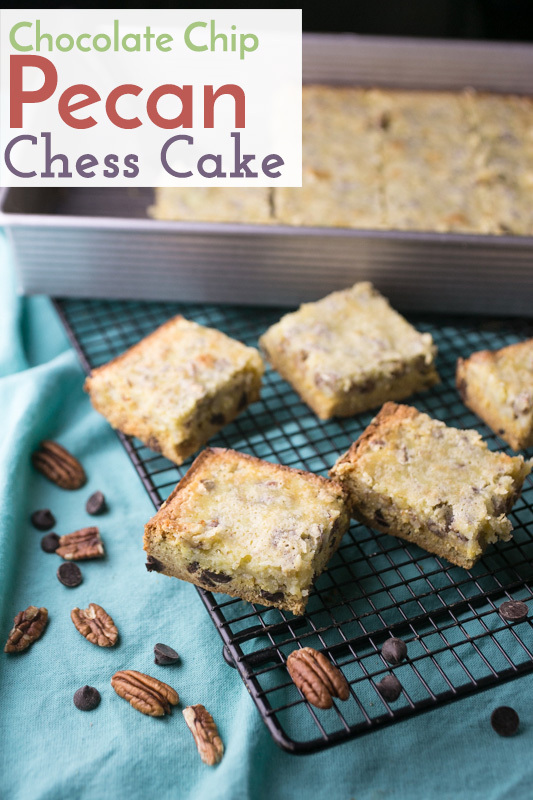 I'm so glad that I can help Melissa out by sharing this chocolate chip pecan chess cake recipe with you guys. I hope you enjoy! My grandmother was the best cook...probably the best cook I've ever known. She was all about precision - she literally measured her chocolate chip cookies and rolled them out by hand so that they were all the same size and shape. This trait I did not get from her. She also loved collecting recipes. I don't remember her having many cookbooks, but she did like to clip out recipes from the newspaper or magazines. She also wrote down every recipe that any of her friends ever made that she enjoyed. You can imagine that she amassed a lot of recipes over her lifetime, organizing them in little retro notebooks that are now mine. I tell you, those little books are among my favorite possessions. I love to dig through them and reminisce over the recipes that she made often. I also love to wonder if she ever made the recipes that I don't remember, or if she just wrote them down and forgot about them. Chess cake was one of those recipes. 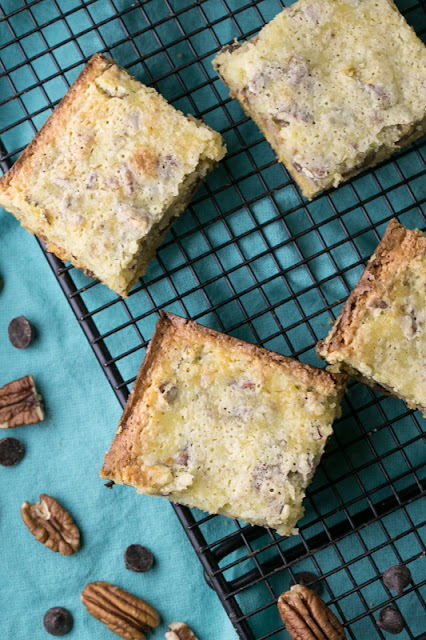 Chess cake is just like your standard chess bars, just FYI. Her recipe did call for optional pecans, which I've never had in chess bars, but they add great texture. 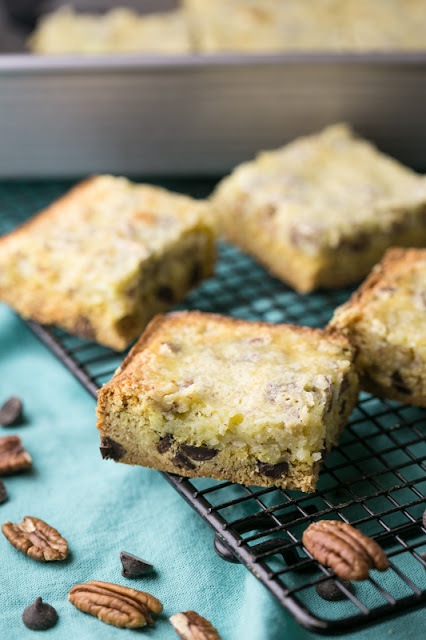 The chocolate chips were my addition, though, so this chocolate chip pecan chess cake is kind of like a combination of a chocolate chip cookie and a chess bar, and how could you go wrong with that? Plus this recipe is so easy, and you can just mix everything up by hand in one bowl. Winning! Preheat the oven to 350 degrees. Spray a 9x13 inch pan with cooking spray or grease with butter. 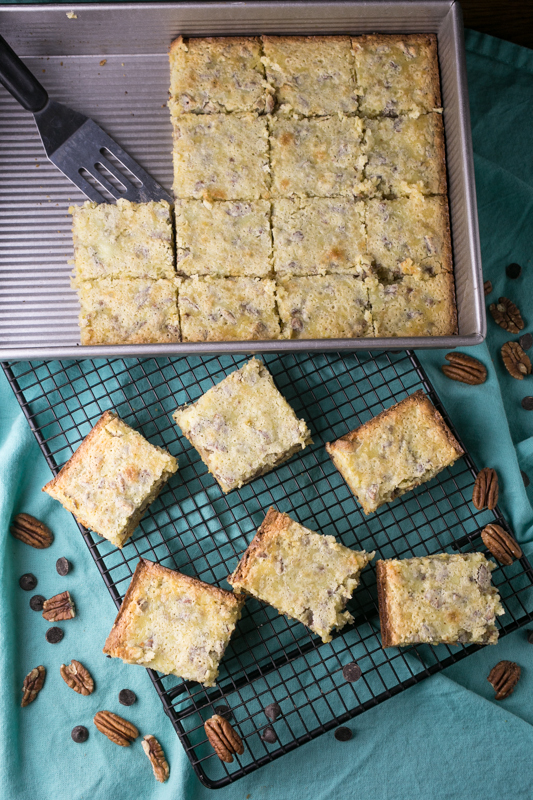 In a mixing bowl, stir together the cake mix, melted butter, and egg until well combined. Stir in the chocolate chips. Spread the base layer into the pan. The batter will be very thick, so it is easiest to use your hands to pat the mixture out to the edges. Wipe out the mixing bowl. 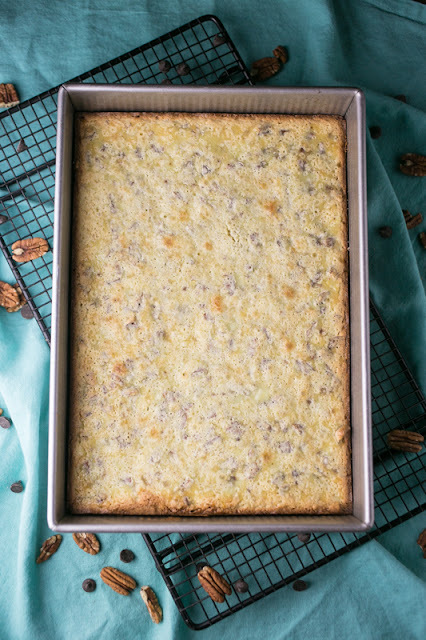 Place the cream cheese, confectioners sugar, and eggs in the mixing bowl and stir until mostly combined (you will probably have a few chunks of cream cheese remaining). Stir in the pecans and pour the mixture on top of the base layer. Bake the chess cake until lightly browned on the top and set, 35-40 minutes. Cool completely in the pan on a wire rack then cut into squares. Thanks so much Mary for sharing such a mouth watering dessert with all of us. I can't wait to get in the kitchen and make this one very soon!